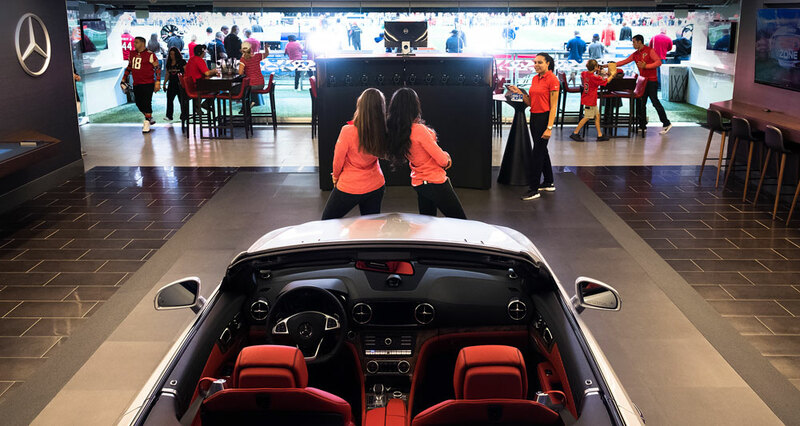 Mercedes-Benz was looking for a way to engage guests in their field-level VIP lounge at the new Mercedes-Benz Stadium in Atlanta, GA.
We worked with Mercedes to create a StudioBooth Array experience that allowed guests to interact with a featured Mercedes vehicle and leave with an unforgettable 3D Boomerang GIF. StudioBooth custom built a branded camera array to integrate seamlessly with the high-end look of the lounge. The experience not only gave guests a fun and memorable take-away, but generated leads for Mercedes-Benz and created social buzz around their newest vehicles. The semi-permanent installation allowed Mercedes to activate at every event for an entire season, generating a huge amount of social shares and online impressions.